Time to Circulate – can you boost circulation? Have a good look at this picture. This is really clever and interesting stuff! 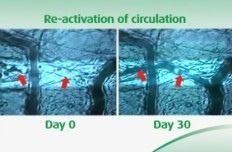 What you can see here are before and after pictures of somebody’s circulation! This is from a study done using A.Vogels Ginkgo Biloba extract. They had a look at the circulation before (the first picture) taking Ginkgo and then again, in the same place (the second picture) after 30 days using Ginkgo daily. 1. The simple fact that they can take these pictures in the first place is so clever and fascinating. Some herbal products are just dried, powdered up herbs. These may contain a good amount of dried herb and could look good on the label. BUT, they may not have been tested to ensure they contain any active components or even to ensure that they are what they claim to be! When buying a herbal supplement look to see if it has been standardised and whether you have a guaranteed potency. Even better go for fresh herbal tinctures – we all know from our experiences in the kitchen, that fresh herbs are more potent than dried.